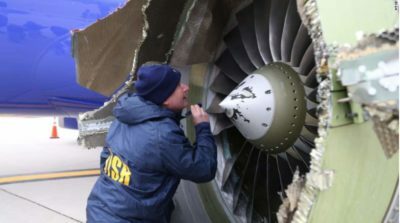 After an initial review of the left engine of the Southwest Airlines aircraft that made an emergency landing yesterday in Philadelphia, the NTSB discovered that one of the 24 fan blades on the engine broke off in flight and caused the catastrophic uncontained failure. Looking at the picture below, one can see that a fan blade is in fact missing and that it broke off near the root, or attachment point. The missing blade is right in front of the elbow of the gentleman pictured. The engine involved was a model CFM 56-7B, which is the exclusive engine used on 737 aircraft. CFM International was the manufacturer and is a 50/50 joint company between General Electric USA and Safran Aircraft Engines of France. According to FAA records, the engine and aircraft both appear to have been manufactured in 2000. The CFM 56 series engines are turbo fan engines. Turbo fan engines generate thrust partly like a propeller driven engine and partly like a true jet engine. The fan in front, which is where the blade broke away in this incident, turns much the same way as an aircraft propeller and generates thrust from that rotation. The remaining air coming into the engine passes the fan and goes into a series of compressor modules where the air is compressed in several stages. The compressed air is then directed into a combustion area where it mixes with fuel and is ignited. Once ignited, some of the expanding gases go out the nozzle in the rear, creating true jet thrust, and the rest is used to keep the engine and the fan turning. Thus, the turbo fan engine gets some of its thrust from the jet exhaust and some from the turning fan. This link will take you to a CFM company web site where you can scroll down to see a video that explains the basic workings of the CFM 56 engine. Also, for the truly technically curious, below is a pdf of the FAA Type Certificate Data Sheet for the CFM 56 engine. It is not yet known what caused the fan blade to break, but the NTSB indicated that it found some evidence of metal fatigue at the blade attachment point. After a technically similar incident in 2016 involving Southwest Airlines, the FAA ordered ultrasonic inspections of similar fan blades to check for fatigue and other defects. It is not yet known whether the engine on this aircraft had been inspected prior to yesterday’s tragedy. This incident, however, emphasizes that it is absolutely critical for the FAA, Southwest Airlines and all other air carriers to stay on top of safety and maintenance issues. Stay tuned, as we will continue to provide updates as more information becomes available.